Out here in New Jersey – a coastal state, mind you – things tend to get pretty cold here in the fall and winter seasons. Even spring can be a cold one until things really start to thaw off in late April and May. There are two ways that you can approach navigating the often harsh qualities of winter: be well prepared for it and prosper, or suffer the consequences of being unprepared. It might not always be that black and white for most people, but the point that we’re trying to make is that it’s always the right idea to be prepared for the winter season. As our readers know, A & C Sprinkler here in Toms River is a leader in irrigation systems maintenance. From basic irrigation repair, complex sprinkler system installation and standard sprinkler blowout services, your precious yard is in good hands when you trust the irrigation professionals at A & C Sprinkler. 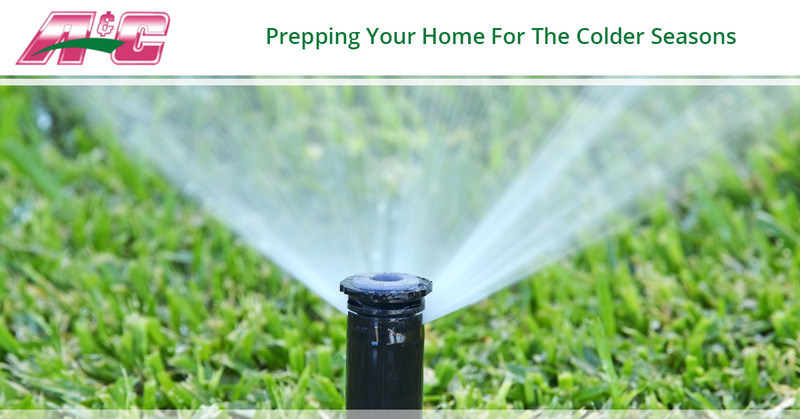 One of the most important winter preparation things you could possibly do is get your sprinklers blown out before the consistent, freezing temperatures of late fall and winter set in. Make this important service happen with a Speedy Fast® Quote or by contacting our Toms River irrigation systems specialists here! If you’re wondering what else you can do to winterize your home and show the harsh winter who’s boss, you’re in the right place! Keep on reading down below to get more winterization tips for your New Jersey home. This is a great way to make sure that your home is properly insulated in order to reduce your heating bill during the winter. Begin by checking your home’s exterior doors for cold air leaks, but do it from inside the house. If you happen to have a laser infrared thermal gun on hand (don’t worry, we don’t expect you to), this is the high-tech way to detect cold drafts. However, if you happen to have a simple candle around the house (admittedly a more realistic expectation), move the lit candle around the door frame – the flame will blow toward you when there is a draft present. Seal a drafty door by installing foam or felt weatherstripping inside of the door frame. Your local hardware store should be able to provide some good insight as far as getting the correct products and correct installation goes. Like weatherstripping or additional insulation around doors, a door sweep is a cost-effective way to prevent drafts from entering your home under an exterior door. A sweep is just a simple, flexible piece of rubber or plastic that’s held to the door’s lower edge by a strip of aluminum. We understand that it’s incredibly nice to comfortably wear nothing but shorts and a t-shirt when it’s well below freezing outside, but unless you enjoy spending a fortune each month on your heating bill, consider setting your thermostat to an agreeable temperature and leaving it that way. If you’re chilly (shout out to all of those basement dwellers), put on a warm sweater and wool socks instead of raising the heat. Warm beverages like coffee, tea, and hot chocolate also go a long way to warm you up from the inside! Dirty furnace filters reduce furnace efficiency and also push up your heating bills. They also shorten the life of your furnace altogether – a costly replacement. Stay on top of this situation by frequently checking and replacing your furnace filter every month or every six weeks during the winter. Your owner’s manual should tell you where it is located. You can save even more on your monthly energy bills by wrapping older water heaters in a blanket of insulation. This is actually a very easy DIY project that even a beginner can do. Just make sure not to cover the burner access. Check out this page for more information on water heater safety. Don’t Forget To Blow Out Your Sprinkler When You Have The Chance! That’s right – the changing of the seasons won’t wait for you. Get in touch with the irrigation systems specialists for your next sprinkler blowout in Toms River from A & C Sprinkler! Schedule A Sprinkler Blowout Today!